Light & Motion, renowned for the innovative Stella Pro Lights built in California, will be at NAB Show 2018 displaying a diverse selection of travel-ready kits designed to push the boundaries of power and portability for professionals (Booth #6643). Light & Motion announces the release of three new compact, powerful, and rugged, travel-friendly professional kits. Combining features of the most powerful Stella Pro single point LEDs, each kit is designed to support capture of highquality content for professional interviews, broadcast news, and expeditionary adventurers. Powerful enough for use in the studio and perfect for on location "Live Shots" in direct sun or in the most challenging weather, the Stella Pro Travel Case Kit series provides more production value to broadcast professionals than any other kit in the industry. 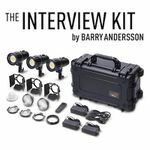 The Interview Kit includes: 2 Stella Pro 8000 RF Lights, 1 Stella Pro 5000 RF light, wireless remote, an array of compact portable modifiers, mounts, and power options packed into a travel-friendly hard-case roller. Total Kit Weight: 27.70lb Stella Pro Combo Kit Designed for mobile production teams that shoot in a variety of constantly changing environments, the combo kit allows crews to create high-quality photo and video content from any location with a total 3-point lighting setup time measured in seconds, not minutes. 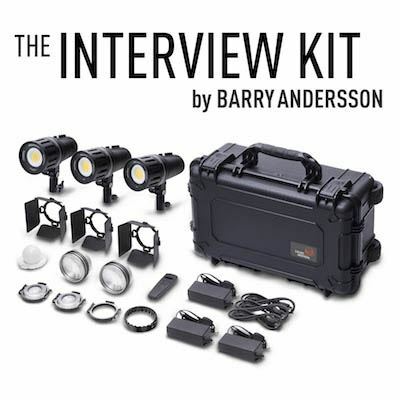 Featuring the powerful Stella Pro 10,000c corded light (D-TAP or Mains) combined with the untethered duo of the Stella Pro 8000 RF and fully waterproof Stella Pro 5000 RF, the compact kit includes a collection of light modifiers commonly requested by broadcast news crews and documentary filmmakers. Light & Motion’s travel-friendly Stella case kits redefine professional 3-point lighting with an unprecedented mix of onlocation power and portability. All three kits will be available to ship May 1 from Stella dealers in both U.S. and International markets. Stella Pro Lights Feature: • High Output "Chip on Board" LED - up to 10,000 Lumens with 20,520 Lux at 1 meter with Fresnel • Certified TLCI 93+, CRI 92+, CCT 5600 Kelvin • Rechargeable Lithium-ion battery operates from 90 min – 6.25 hours (5000 RF) and 50 min – 4 hours (8000 RF) completely cord free. • Stella’s Integrated battery is permissible in both checked and carry-on luggage. • Controlled focus from 120° down to 50° & 25° with portable modifiers • Broad range of accessories including Profoto, DOP Choice, and Chimera adaptability • Regulated lumen output - does not fade during battery operation • Fast Charge of 2 hours, 80% Charged in 1.5 hrs • Runs off wall power, DTAP, 11 - 25V (Stella Pro 5000/8000); 13 - 26V (Stella Pro 10,000c) • Tested Flicker-Free - up to 10,000 fps • OLED Digital Display for precise readout with power output, battery, and charge status. • Dimming with stepped or continuous control • Built in Elinchrom wireless communication transceiver supports up to 20 frequency channels and 4 light groups (RF Models Only) • Certified performance (FL-1 Standard) About Light & Motion Beyond bright, we are Powerful, delivering remarkable output from some of the most innovative, lightweight lights on the market, lights that deliver certified high TLCI and high CRI in a daylight or Tungsten balanced head. We are Portable, making the most compact easy-to-use lights in the industry. We are Progressive, one of the few lighting brands to design and build our products in the USA and the only brand to certify our products to the rigorous FL-1 Standard. Light & Motion products come with a 2-year enhanced guarantee. We have been recognized for our pioneering business practices and smart carbon footprint through numerous environmental awards, including the US Commerce & Trade Research Institute’s 2015 California Excellence Award recipient. For additional information, please contact us at: hhall@lightandmotion.com or 831-645-1538.